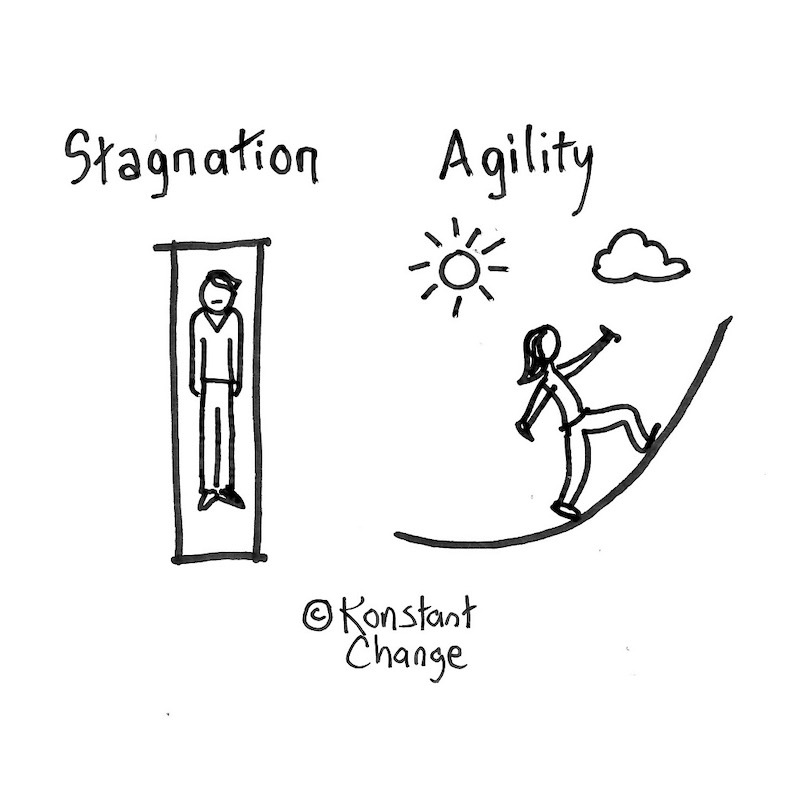 Stagnation is the enemy of employee retention in the modern workplace. Which leads to the important question, why does anyone leave their job after a year or two? The big problem is when people leave roles too quickly. Organizations spend significant resources to recruit new hires, only to discover a surprise empty chair in the department. This happens before the company has a chance to develop the individual or gain a return on their investment. I’ve interviewed many millennials on this topic. In fact, I am often approached by young people who see my topic of career agility as a logical reason for their job-switching decisions. They make swift strategic moves in pursuit of a more interesting or lucrative opportunity. In fairness to these types of decisions, it’s important to note that they are just optimizing their place in the market. In a report by Gallup, it has been estimated that millennial turnover costs the U.S. economy $30.5 billion annually. Gallup also stated 41% of millennials expect to be in their current job for two years or less. As an employer, you screened your new hire, made a reasonably swift hiring decision, and launched a proper onboarding program. You even started the process of training them for a specific job. As a job candidate and then employee, your soon to be valuable resource researched the company and invested time getting to know your work environment. Yet a valuable worker may leave your company for another role without giving you advance notice. Or even an opportunity to have a conversation before she makes her decision. The opportunity to learn and grow is missing. There is no clear path to realize career goals. Creativity, growth, and happiness are sorely lacking. No one wants to be stuck in their career. When constraints and frustration set in, employees are more likely to be wooed away by the competition. Or they may uncover a unique opportunity not even on their radar. They are prime targets for poaching! When people are stuck, they will move to a role that meets their interests and expectations. A culture of learning and development will enliven attitudes and shine a spotlight on developing talent. When people are bored, employee retention is harmed. They glance at their watch, waiting for the day to be over. This happens when a role lacks variety, the person is not a good fit, or the day-to-day tasks become repetitive. Like the slow-moving clock on the factory floor, a buzzer signifying the end of a factory shift feels more like an escape rather than a job well done. Stagnation leads to boredom. Like a river or pond, there is no movement. No one wants to measure time throughout the workday. Rather, employees prefer engaging and challenging assignments where efforts make significant contributions. When this happens, time goes by fast! Individuals look forward to what’s next with a sense of anticipation, rather than dread. If employees don’t understand or hear about your business strategy or how their efforts fit in to the bigger picture, departure is imminent. This will derail their commitment to the values and goals of the company. Employee retention takes a dive. Communication from leadership stimulates engagement, especially when employees make the connection between their contribution and company goals. When there are major company announcements, people appreciate transparency and direct communication. They do not like hearing about company news online that impacts their departments or jobs. Events like mergers and acquisitions are unsettling when employees are the last to know. After hiring a recent college graduate, I asked her the question, what do you want to accomplish with your career? She answered, “I want to change the world.” While this seems like a lofty goal, it is not a unique response. I’ve posed this question many times and frequently get a variation of this answer. And it’s not just the millennials who are in search of meaning. Mid-careerists in the reinvention stage of their careers may also require something different. In summary, there are many more reasons workers choose to leave their current situation, rather than try to fix what’s wrong in their workplaces. Again, a reminder stagnation is the enemy of employee retention. Yet one thing is true, we could all benefit from a more agile approach to listening and communication skills, a strategy that will encourage employees to stay. Chip Conley, in his book Wisdom @ Work, states listening skills will optimize the value of multiple generations working together in the workplace. As an advisor, global head of strategy, and advocate for learning and development within Airbnb, he has influenced the company culture and the way people interact with each other. He honed these skills to help the company’s leaders and their employees manage their dramatic growth. Regardless of individual rationale for making moves, businesses can stem the tide of departures. The can start by addressing the reasons people leave Thus, decreasing Gallup’s startling turnover costs for the U.S. economy and providing a measuring of stability for both employer and employee.